We ended up making a field change due to the weather moving to the Proving Grounds to make use of their turf fields. We got our Region I Cup Finals played this past Sunday crowning three champions that will head out to Virginia Beach seeking to keep the national titles in our Region. Last summer Region I did the National Cup sweep with its teams winning the Werner Fricker USASA Open Cup, the Gerhard Mengel USASA Over-30 Cup and the USASA Amateur Cup. Our sides look to repeat at the Virginia Beach Sportsplex Stadium with the final four played between 16 to 18 July. The Werner Fricker USASA Open Cup was the next final of the day with local side West Chester Majors of Eastern Pennsylvania taking on Newtown Pride FC of Connecticut. West Chester got off to a blazing start as Joe Sales took a pass from Matt Poole and put it away into the left corner. Two minutes later, Poole was instrumental again seeing Justin McCall on the left flank and sending him the pass. McCall cut to his right to hit a 30-yard bomb to give the East Penn team a quick 2:0 lead. Newtown Pride refused to be denied and cut that ​​deficit by one just before the half. Mauro Dos Santos put the ball across to Juan Galvis whose cool composure got his team back into the match. That goal energized the Pride as they created many chances in the second half. The scoring duo hooked up again, this time from a Dos Santos corner kick that Galvis headed into the goal to draw the game even at 2:2. Momentum was with Newtown as West Chester was a man down in the 76th minute after their right back was given a second yellow for a late challenge. It looked as the encounter would go into extra time but an injury time scramble in front of the Newtown goal was the decider. Poole sent his cross into the penalty area that saw Pat Tobey's shot saved by Newtwon keeper Drew Nucifora. The rebound went to Sales whose twice had his close range shots denied in front of the goal. The last rebound went to Tobey who shot from 8 yards out that was deflected and rolled by a sprawling defender. 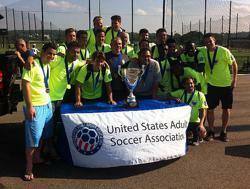 The 3:2 win gave the 7-year East Penn team its first Region I title and trip to a USASA National Cup final. West Chester will kickoff in the national semifinal against Region IV winner Chula Vista of California South. We ended the day with two sides familiar in playing regional finals with the Maryland Bays and Battery Park Gunners from Massachusetts competing for the USASA Amateur Cup. 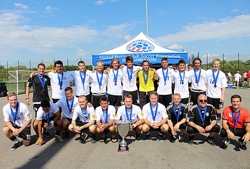 The Gunners won the national Amateur title in 2012 while the Bays were close to completing a regional cup double last ​​summer on their way to winning the Fricker Open Cup. The Bays went up ​​1:0 when Levi Houapeu bent his 15th minute free kick over the wall and underneath the Gunners crossbar. Both teams attacked the other's goal but the scoreline remained the same at the half. Collin Rome guaranteed the trip to Virginia Beach when he made good on a rebound from Elton Joe's shot in the 85th minute. The 2:0 victory sees the Bays heading out to their second straight USASA National Cup Finals, this time hoping to return with the Amateur Cup. Their semifinal opponent will be Region IV champion Olympic Club of California North. Our three champions were among over 100 that battled through state qualifiers. We had 10 state associations across Region I that conducted cup competitions. Our Region has a long and proud history in the cups and our success comes from the work of our state associations and teams that compete in the cups. We congratulate not only our winners but all of the teams who took part in our cups and encourage them to return next season.